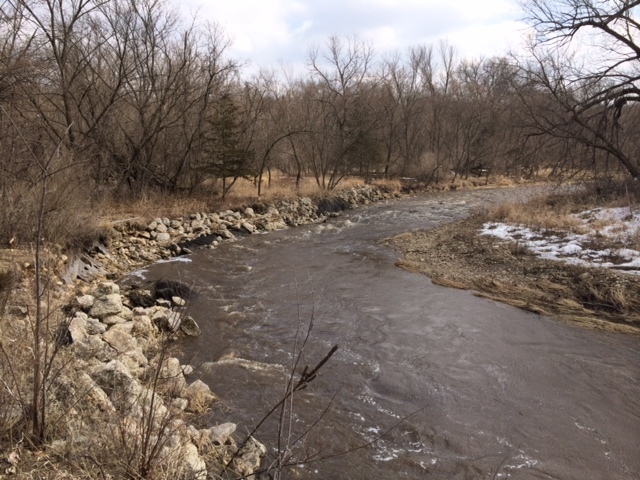 It’s been relatively easy to find a good spot to fish for more than a week now, but things were rough on a lot of water at the end of March and the beginning of April due to runoff, rain, and a little additional snow. Not un-fishable in southeast MN, but there was plenty of turbid water. Now that the snow has been almost completely gone since this past weekend (some north-facing slopes still have some stubborn drifts-turned-glaciers) and we’ve got a break from precipitation, we should be in good shape. A good friend and I took our kids camping for spring break from the 31st of March through the 2nd of April. We were the only campers in all of Whitewater State Park, which was awesome. The kids had a great time despite the fact the river through the park was in rough shape until our last day and the weather wasn’t always agreeable – but it’s rarely perfect. This is how things looked through Whitewater State Park on Monday, March 31st. After a blustery, cold Tuesday with more time spent around the fire or in the camper, weather and water improved Wednesday, April 2nd. I’m sure outside the park and farther upstream was in much better shape, but we stayed put with 4 kids. The kids were casting fly rods, spinners, and a Rapala, but fish were stubborn. Still, they kept casting for quite a long time. We managed to catch a couple of trout, but that was it. 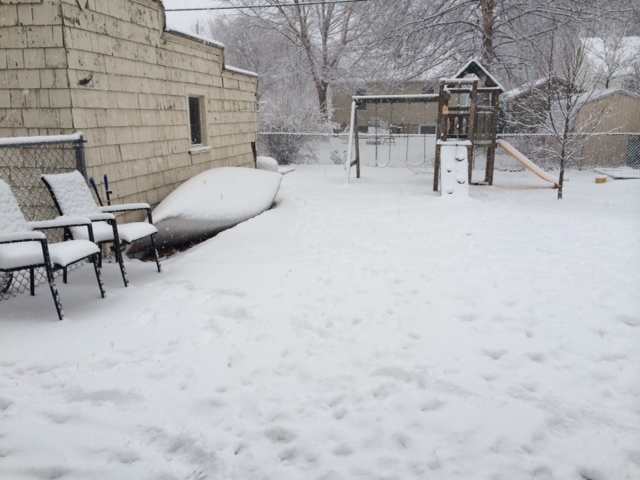 Last week wrapped up with a fresh blanket of snow on Friday morning, the 4th, which disappeared by the end of the weekend. 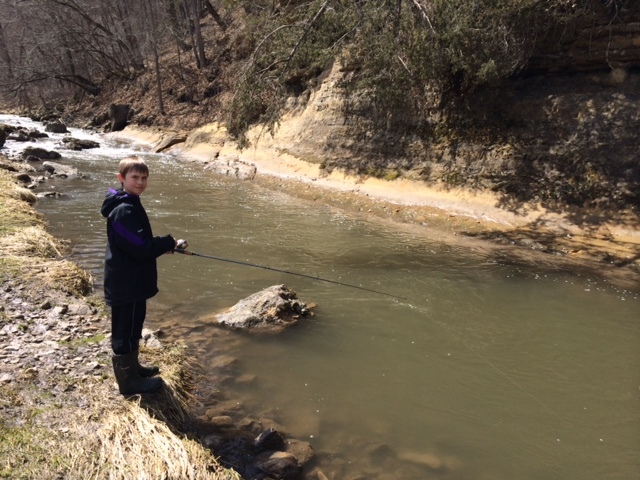 I got out yesterday (Tuesday, April 8th) morning and fished a clear stream. Temperatures were in the 40s in the morning with mostly sunny skies and a stiff, northwest wind. I managed a handful of fish, all on an orange scud, although I tried small nymphs, a midge, and a small, green soft hackle to no avail. It was more turbid farther downstream, but that could have been as much cattle as it was remaining runoff from some snow banks stuck on an east-west running feeder. Most remaining slopes/ditches should lose their snow today due to the warmth and wind. Stream conditions should be good this weekend; probably better than the weather with showers/thunderstorms Saturday and a chilly, wet Sunday in store. You can check out quite a few, recent trip reports and stream condition reports on the message board. Feel free to share your own reports, they’re helpful. 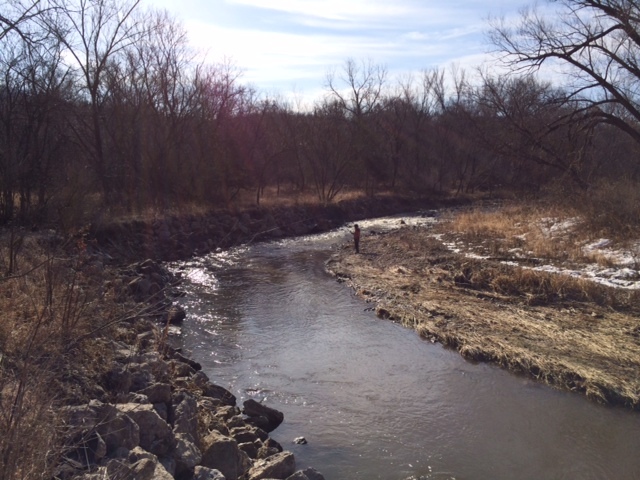 This entry was posted in Stream Conditions, Trip Report on April 9, 2014 by Randy.